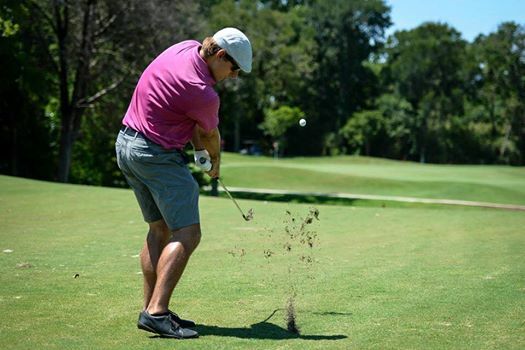 THIS FROM FACEBOOK FRIEND JAY REYNOLDS, who this past week played in the Austin Men's City Golf Championship. "I did something pretty cool this week: broke Ben Crenshaw's 40-year-old course record at [Lions Municipal Golf Course], with a 60 in the first round of the Austin Men's City Championship," Jay said. "Then fought off some great charges to win by 9 overall, shooting 69-74-67 the rest of the way. Pretty darn good week of golf for me, best in a long time. We have a fantastic local golf community and it was really fun to play so well and share it with so many people." Jay's 60 included a 27 on the incoming nine. He finished the record-breaking round with an eagle 2 on the par-4 18th. On Facebook, Jay got nearly 500 likes and 100-plus comments offering congratulations. And he posted the above photo, which he granted me permission to use here. We chatted a bit, and I mentioned Crenshaw. Jay said, "Anytime you get to mention your name in the same paragraph as his, it's pretty cool."